The night does not go well. I get sick and have to wake up many times and find the toilets in the dark. In the morning, after 6am Graham offers to bring a tea while I’m still in my tent. Nice one Graham. We spend most of the morning chatting, drinking tea and having breakfast. Graham is an expert in maps and design them as well as other products. This intrigues me. He also took part in some movies, I write down a few names to make sure to take a look. Being tired from sickness and a very long riding day, I decide to not rush. Today I will reach the hut I was supposed to reach yesterday, which was lucky because Graham and Joanne took great care of me. Packing up slowly and with only 3 kms to go, another couple, Claud and Christian, stops by and ask about my bike trip. Claude, wants to know whether the BNT can be done on a bike. I advise not to do the Victorian part. Turns out they are originally from France, they moved to Australia 40 years ago. Most of the conversation happens in English, mixed with a little bit of French and Australian accent. Claude and Christian are keen on kayaking and many other outdoor sports. They offer me to come by their house one day, I’m meeting so many great people at the moment. Finally on the go I reach Keebles Hut. The view of the mountain and the river is mind blowing. A perfect spot for holidays in good weather conditions. That reminds me that this is why I’m on this trip: experience some of the gems Australia has to offer across a wide section of the country. Being Saturday, I’m not alone here. Most of the time I prefer not being alone except when I’m under the weather like this afternoon. A nap and a cold (very cold) swim should do it. The swim is a good opportunity to chat with my friendly camp neighbours. Turns out that is a good thing to do. For the fourth time in a row I am invited to share the fire. This is a camp of two families with teenagers and kids. 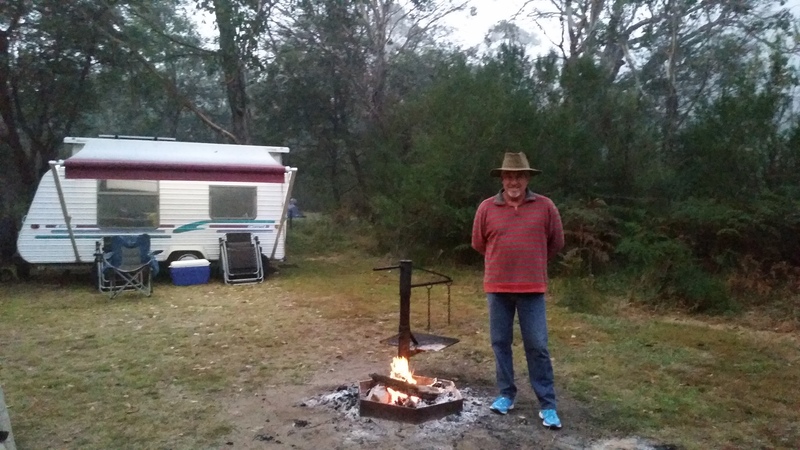 I cook my dinner on their fire but they offer me their food too, and beer and we finish the night baking damper on the fire and filling it with golden syrup and condensed milk. That is a messy business but a lot of fun. What a nice evening. Once again I hope for the best with my stomach. Going from sickness to eating anything I can find in one day is really about trusting your guts. The fire is great and everybody is friendly and has a lot of positive energy.